Play a great Halloween game in school that children can enjoy during their classroom parties. Whether you prefer to revise classic games in a manner appropriate for Halloween or if you would rather use holiday-specific games, there are several options available to you. Coming up with Halloween games for school parties does not have to tax your brain. Take classic children's games and make them into a spooky new version to keep kids entertained. Not only is it easy and simple, but saves you time explaining directions to new and complicated games. 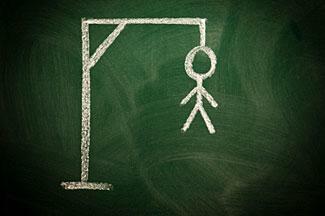 Hangman: Older school kids will get a kick out of playing hangman. Make sure phrases relate to the holiday, and draw a skeleton instead of a stick person. Pin the Tail: Hang a picture of a black cat on the wall and have students try to attach the tail. This also works for a witch's hat, Frankenstein's nose, or the pumpkin head of the headless horsemen. Hot and Cold: Have students leave the room and hide a bone somewhere in the classroom. When they come back, have them pair up and search for the bone. Say "hot" when they are near the bone and "cold" if they are too far. The bone could be drawn in paper or use a cleaned chicken bone. Halloween BINGO: Hand out bingo cards with a ghost in the free space. Instead of spelling BINGO across the top, spell GHOST and use candy for the markers. Musical Chairs: Play musical chairs using spooky music, like The Monster Mash. The Witch Says: Instead of "Simon Says" have students play "The Witch Says." Pass the Pumpkin: Holding a small pumpkin under their chin, students will try to pass the gourd onto the next person in line without using their hands. You can have small prizes, like spider rings or goofy glasses available for winners, but it is not necessary. Certain games only make sense to be played during the fall season and around Halloween. Kids at school Halloween parties will get a kick out of playing games they normally do not get a chance to participate in during the rest of the year. Bobbing for apples is a fall party favorite. Make sure you have plenty of towels available because it can get really wet! 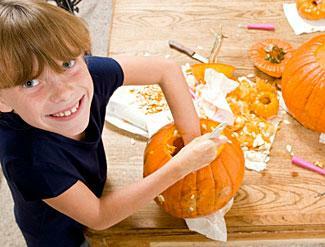 Older students will enjoy carving out their own pumpkins into creative designs. Invite a lower-elementary class to "buddy" up with for the activity. The younger kids will enjoy scooping out the pumpkin's innards. Take snapshots of the students with their buddies and their jack o' lanterns. Divide students up into teams. Hand each team a grocery bag full of old clothes and props. Set a timer for 5 minutes and have them come up with the wackiest costume they can imagine. Perfect for kids in grades kindergarten through second grade, a "creepy-crawly" station will surely delight their senses. Use old shoe boxes decorated in orange and black as shadow boxes. Cut a hole into the box just big enough to stick an arm through. Place creepy items, like wet spaghetti noodles, reptile skin, or peeled grapes into each box. Label them things like "mummy brains," "witch's skin," and "vampire eyeballs." This party game is perfect for any age group. Have students sit in a circle. Start off by saying one sentence that could open a story, such as "I was babysitting my younger brother when I heard an awful scream!" The student next to you will then add to the story starter by saying another sentence. By the time the end of the circle is reached, the story should be complete. Whether you are a teacher or if you're a parent who is helping out in your child's classroom, it's important to realize that youngsters are likely to be particularly excited and rambunctious during this type of event. You'll need to come up with a game plan to help keep things moving along smoothly. Rather than allowing the kids to go back and forth between the various games and activities, assign the youngsters to groups and come up with a schedule that governs when each group participates in each activity. This will help keep things going smoothly and help make sure that everyone has a fair chance to play each game. Using Halloween games for school parties will make sure your students keep occupied and have a great time. 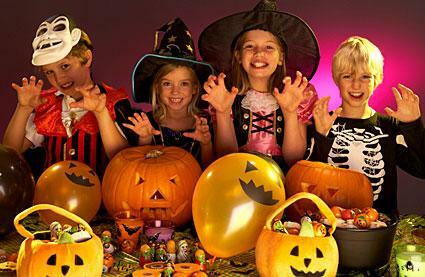 Combined with fun food and activities, the kids Halloween party will be one they talk about for the rest of the year.